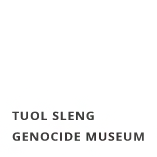 All text, images, video clips, audio files and other content on this website is the property of the Tuol Sleng Genocide Museum. The Tuol Sleng Genocide Museum invites visitors to use the content on this website for personal, educational, and other noncommercial purposes. Copyright and other proprietary rights may also be owned by individuals and entities other than, or in addition to, the Museum. The Tuol Sleng Genocide Museum expressly prohibits the copying of any protected materials on this website, except for the purposes of fair use as described below. Users must cite and link to the Tuol Sleng Genocide Museum website as the source of the content. None of the content may be altered or modified. Users may not remove any copyright, trademark, or other proprietary notices associated with the content. Users must comply with all other terms or restrictions, which may be applicable to the individual file, image or text. Unauthorized commercial publication or exploitation of text, images or content of this website is prohibited. Anyone wishing to use any Museum content for commercial use, publication, or any purpose other than fair use as defined by law, must request and receive prior written permission from the Tuol Sleng Genocide Museum. Permission for such use is granted on a case-by-case basis at the sole discretion of the management of the Tuol Sleng Genocide Museum. Links from this website to other web locations are provided for the convenience of users and do not constitute any endorsement or authorization by the Museum. The Museum is not responsible for the content or reliability of the linked websites and does not necessarily endorse the views expressed within them. The Museum is not responsible for the reliability of any third party material and does not make any warranties regarding that material or necessarily endorse the views expressed in it. To the extent permitted by law, the Museum disclaims all liability whatsoever arising from, its publication of, any use of or any reliance on any third party material appearing on this website. If you have any questions concerning the content of this website, please get in touch with us.